John David Jackson: From 2 Division World Champion to Champion Trainer! When John David Jackson won the WBO 154 title in 1988 stopping former WBC champion Lupe Aquino there was little fan fare. From 1988 to 1992 he wasn’t able to get the other organizations champions to fight him. When in 1993 he moved up and won the WBA Middleweight title from Reggie Johnson he thought all that would change but it didn’t. He was the 1981 AAU champion ending with a 206-9 simon-pure record. He was a member of Joe Clough’s Tacoma Boy’s Club. Now Jackson, the former two-division world champion has been training boxers since his retirement in 1999 with little fanfare. “It doesn’t bother me for I am a low key person. I don’t try to take away from the boxer’s what they have achieved. The best trainer I ever had was George Benton. He once told me I would make a really good trainer due to my patience, no ego and I’m just like him,” said Jackson. Back in Philly Benton brought in Pernell Whitaker whom he was training to spar with Jackson. “I told George he (Whitaker) better not try to fight me. When he did, I beat the hell out of him,” said Jackson. This writer met Jackson when he first came on the scene in Philadelphia turning professional in March of 1984. His team consisted of manager Bob Connelly, trainer George Benton and matchmaker Gary Hegyi for his first 5 fights ending with defeating Felipe Montellano, 4-1. “His son Jimmy (retired with an 16-0-2 record in 1982) was very jealous of the relationship Bob and I had so he reluctantly released me,” said Jackson. He stayed in the Philadelphia area for 4 or 5 years keeping Benton as his trainer. In his first fight away from that team he defeated Gary Tibbs, 4-0-1, in Atlantic City. This writer informed Jackson I put him in with Robert Thomas, 7-35-2, as unorthodox southpaw in his third fight. He also fought him in his eighth fight. Thomas defeated future IBF super middleweight champion Charles “The Hatchet” Brewer twice and drew with Eric Harding (debut). By the end of 1987 Jackson had defeated Mike Castronova, 21-5, Milton Leaks, 12-2 and Tony Ojo, 17-7. “Leaks had a herky-jerky style. Ojo was fine until the weigh-in when he started cursing me. He went out in 3,” said Jackson. In his sixteenth fight he was matched with former WBA light middleweight champion Davey Moore, 16-4. It was July of 1987, when Jackson defeated Moore, but it wouldn’t be until December of 1988 that he would meet Lupe Aquino, 33-4-1, for the newly formed WBO vacant title. Aquino was the former WBC welterweight champion who in his 2 previous fights had defeated former WBC welterweight champion Milt McCrory, 33-2-1 and Royan Hammond, 16-0. Jackson’s inactivity was due to managerial problems with his Detroit investors. Jackson had Aquino down in the first and retiring after the seventh in Detroit’s Cobo Arena to win the WBO light middleweight title. “It was great winning the title but you weren’t rated in any other organizations. They didn’t want to fight for the new group’s title,” said Jackson. Manny Steward would be with him for 3 fights starting with this one. In Jackson’s first defense he took on Steve Little, 16-10, who lived west of Philly, in Reading, PA, and was a cousin to Meldrick Taylor. Little had a win over the former WBA champion Pipino Cuevas with losses to Terry Norris, Rob “Bam Bam” Hines and Davey Hilton. Little was stopped in the seventh round. This same boxer would defeat Michael Nunn in 1994 for his WBA super middleweight title. His next defense with Martin Camara ended up in a NC 11 though Jackson was well ahead 110-95, 106-98 and 108-96. “He dove on me in the eleventh round and the French commission said a fight cannot end that way. The WBO recognized it as a defense and win for me,” said Jackson. In October of 1990 Jackson traveled to the UK and defeated Chris Pyatt, 30-2, of the UK who had his 11 bout win streak stopped. It would be 9 months later when he defeated Kronk’s Tyrone “The Butterfly” Trice, 38-3, in Atlantic City. Trice had lost in 2 previous challenges for Simon Brown’s IBF welterweight title. “We had previously sparred together once. He was a puncher,” said Jackson. In Jackson’s fifth title defense he stopped San Francisco’s Pat Lawlor, 18-1, in the Bay City in June of 1992. Lawlor had a win over Roberto Duran. At the end of 1992 Jackson traveled to Italy stopping the Italian champion Michele Mastrodonato, 17-1, in the tenth. During his 4 year reign, Julian Jackson (WBA), Terry Norris (WBC), Sumba Kalambay (WBA), Rob Hines (IBF), Darrin Van Horn (IBF), Michael McCallum (WBA) and Gianfranco Rosi (IBF) all held titles while Jackson did. “John and I sparred a couple of times. He was a very good boxer. Buster Drayton had lost his title the year before or we would have had 3 light middleweight champs all fighting out of Philly at the same time,” said Hines. Today Drayton is helping to reach out to youth in a correctional facility in Philly. “John Jackson displayed a lot that people didn’t think he had,” said Drayton. “After the Mastrodonato fight I gave up my title to compete at 160 and was promised a title shot with WBA champion Reggie Johnson, 34-2-1, if I gave up my title,” said Jackson. The WBA said if he gave up his title they would rank him No. 5. “I knew I would never get a shot ranked that low. I insisted on being No. 1. Johnson couldn’t figure how Jackson came out of nowhere to be ranked No. 1. It would be October of 1993 when they would meet in Buenos Aires, Argentina. Jorge Castro would be on the card hoping to fight the winner. “The WBA gave me 2 contracts. One for Johnson and one for Castro if I won, but I only signed the one for Johnson,” said Jackson. He defeated Johnson in a close fight 115-114 (twice) and 115-113. “I spent 125k in court costs trying to keep my title. My trainer/manager slapped Castro’s manager at the press conference for calling me a thief” said Jackson. The title was declared vacant and in August of 1994 Castro defeated Johnson for the title. In the meantime Jackson defeated Jeff Johnson, 16-7-1, when Johnson refused to come out of the corner after 7. This was in May of 1994. In September he knocked out Danny Garcia, 25-12, in 7 rounds. Both fights were in Atlantic City. In December of 1994 Jackson and Castro finally met for Castro’s WBA middleweight title in Mexico. Jackson, then 32-0, was well ahead after 8 rounds by scores of 80-71, 80-72 and 79-74. “I had no idea I was ahead so in the ninth round I decided to mix it up with Castro after out boxing him the entire fight. I got hit with a punch I did not see coming,” said Jackson. Castro won the title by the only way he could stopping Jackson in the ninth. Philly’s “Rockin” Rodney Moore was on the undercard. “What an awesome fight Jackson was displaying until the knockdown. He fought a great fight in Mexico and I believe that if John had fought that fight somewhere else he would have possibly became champ. John was a helluva good fighter and Castro was a hard punching champ,” said Moore. The fight was voted 1994 Fight of the Year by Ring Magazine. Jackson had his first fight after the Castro fight in April of 1995 at the US Air Arena, in Landover, MD, defeating James “Hard Rock” Green, 22-8-1. There were 3 world title bouts on that card including Bernard Hopkins defeating Sequndo Mercado for the vacant IBF middleweight title in a rematch of their draw. Jackson would take a pair of decisions before losing a controversial decision to Abdullah Ramadan, 9-6, in Ft. Lauderdale, FL. “I got dropped in the first round. I took rounds 3 through 10 and still lost,” said Jackson. Just 4 months later Jackson was asked to fight Hopkins for his 160 title in April of 1997. “I hadn’t made that weight in almost 3 years. I asked to have it at a heavier weight (would have been non-title). King told me it would be another 3 years before I would get a title fight if I didn’t fight Hopkins then. I was 180 and worked down to 156 leaving myself drained. We had sparred in the gym and I felt I got the best of Hopkins who is a very good fighter. By the fourth round Hopkins had a smile on his face knowing I had nothing left,” said Jackson. The bout was stopped in round 7. In February of 1998 Jackson now away from King, did something he never thought he would do. “I was cash poor. They offered me 150k so I took a rematch with Castro, 104-6-2, in Argentina. (Jackson 168, Castro 173 ½) I didn’t see him get on the scale but he looked much bigger than the last time we fought,” said Jackson. Castro would score 2 knockdowns before stopping Jackson for what was listed as the vacant WBA Fedelatin super middleweight title which Castro officially was over weight for. The fight went the distance of 10 rounds in favor of Castro by scores of 95-93, 96-94 and 99-98. It seems the knockdowns won Castro the fight. “He hit me so hard in the first round I rolled over. In the fourth he hit me with an uppercut and I tripped over my own feet for the second knockdown,” said Jackson. In September of 1999 at the age of 36 Jackson would have his last fight. “I couldn’t get fights after the second Castro fight but for low money. They offered me 20k and I wanted 50k. They came back with 30k and I took it,” said Jackson. He would stop Dave Boone, 16-6, in Temecula, CA, in the second round. Jackson’s final ring record was 36-4, with 20 knockouts. 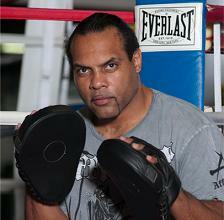 He is living in Timber Pines, FL, and is known as one of the finest trainers in boxing. His gym is called “Action Jackson Boxing Academy”. He can be reached at John-David-Jackson@hotmail.com Between NJ and PA Jackson was 20-0. He is certainly one of the most intelligent boxers this writer has interviewed. He is a very low-key person who has trained many boxers including his old foe Bernard Hopkins. “There are still some great trainers but no great teachers. When I got started training boxers I picked the brains of Quenzell McCall, Wesley Mouzon and Eddie Futch,” said Jackson. Well, you couldn’t go wrong with those 3!